We all sort of have an idea of how it works: craft brew is lovingly hand-coaxed into existence, while commercial brew is rattled around in big, scary machines, right? Well let's see with our own eyes. The good folks at St. Louis Public Radio have done a fun GIF series peeking inside the operations of both Anheuser-Busch and a tiny microbrewery. On one side, we have Anheuster-Busch of Budweiser fame, which makes 15 million barrels a year at its St. Louis brewery, one of the largest in the world. On the other is Perennial, a tiny, three-year-old craft brewery, based in the same city. Let's see how they stack up. We'll start where all beer starts: grains. "At Anheuser-Busch, grain arrives daily on about a dozen train cars, each holding more than 150,000 lbs," according to St. Louis Public Radio. That big yellow tube on the left is grain pouring from the train cars into the factory. 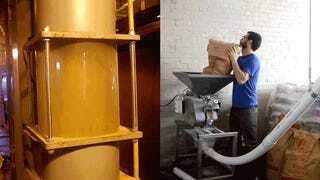 A brewer at Perennial empties sacks of grain 50 pounds at a time, which is still heavy lifting but it's no train car. At the other the end of the process is packaging. Anheuser-Busch's dozen packaging lines each spit out a blurry 1,000 cans per minute. 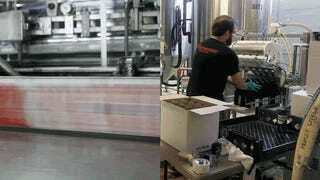 At Perennial, a couple of people rinse and package about a hundred bottles by hand every few hours. Watching the two side by side is like watching a footrace between the Flash and Bruce Banner. Correction: This post originally referred to a story produced by NPR. It is actually produced by St. Louis Public Radio.